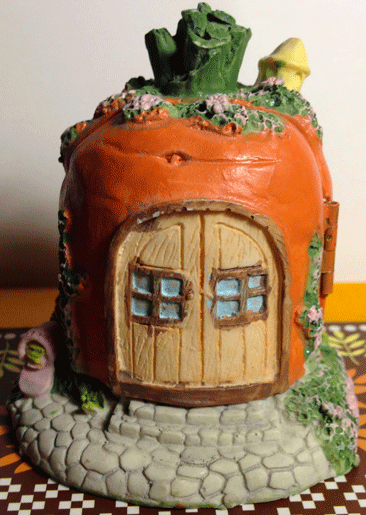 There is no maker's mark on this little carrot house. The front section with the door is hinged and swings open to reveal a domestic family scene. An adult female bunny sits at a wooden table surrounded by two baskets of eggs that she is working on painting. 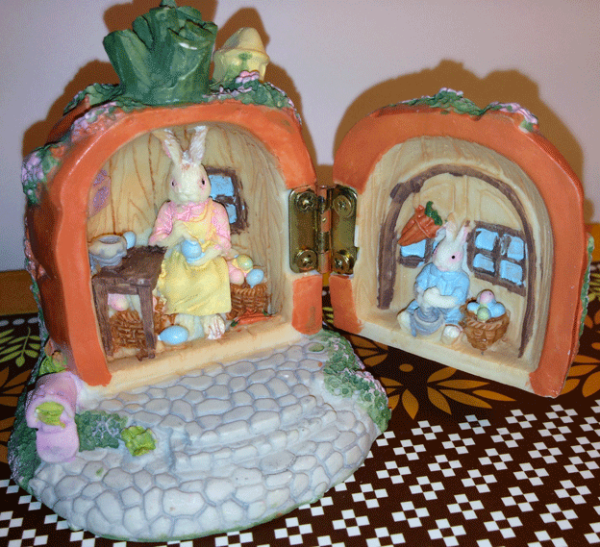 On the inside of the hinged door sits a young bunny with another basket of eggs, helping with the painting. It's a very detailed little scene. A nice Easter decoration. It is about 3 inches high and 2.5 inches wide at the base. It weighs 6.1 ounces. See more pictures below. 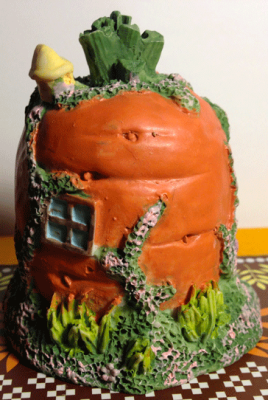 This little carrot house is well over 30 years old. 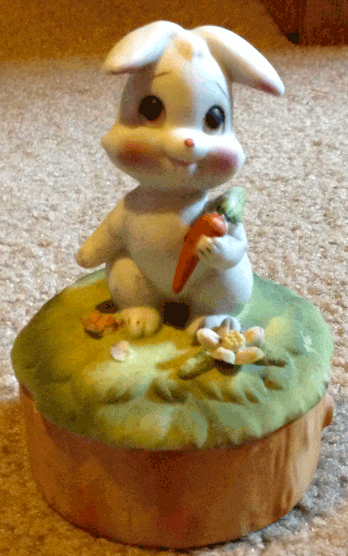 A white rabbit sits with a carrot on top of this little round decorative box, made to hold candy or buttons or trinkets, small items. 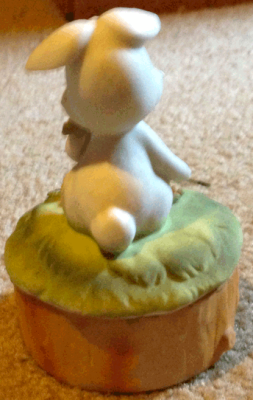 The base is shaped like a tree trunk. 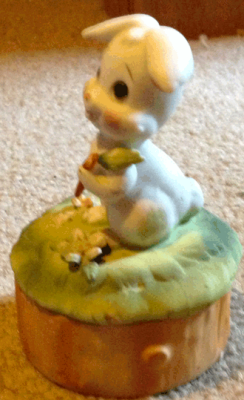 One of the flowers have broken off in front of the rabbit's right foot. 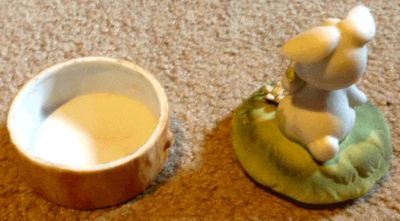 The rabbit has a smudge of green pain on the right flank, which can be seen in the photos below. 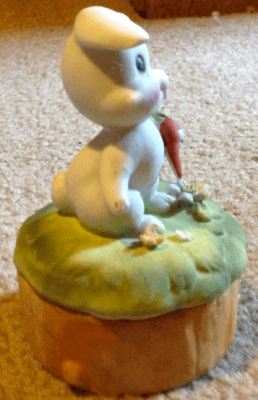 The rabbit and dish together are about 4 inches tall and 3 inches wid at the base. It weighs 5.1 ounces. 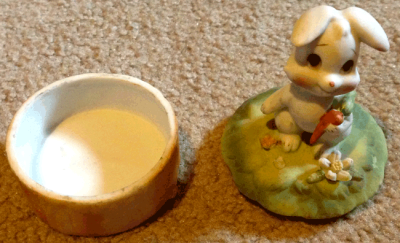 This little trinket dish is well over 30 years old.